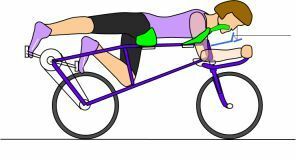 To avoid these inconveniencies, the recumbent bicycle made it possible to line up all the body segments. 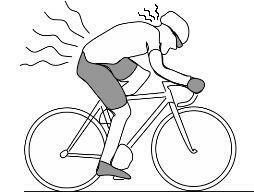 Thus, on the H-Zontal Bike, the body is perfectly lined up with its bases on different supports. You can breath without any problems because the supports are set out in order to maintain the body on the hips and the clavicles, so as to let the abdomen and the rib cage free. The nape of the neck is relieved thanks to the face support, which maintains the head on the level of the cheekbones. It's not necessary to keep your head up because you can pilot with the mirror system which allow you to see the road looking downwards.